Cobra has been designed and developed to enable us to offer one of the most efficient glue board insect control systems available. The NEW & INNOVATIVE translucent technology incorporated in the Cobra emits the most UV light intensity compared to similar types of units. This Unique UV dispersing technology allows for the light to shine from the front, top and sides covering large areas and thus increasing the fly catch - even for small flies. Our extensive research has identified that shape and colour as well as light output, influences the number of insects attracted. The Cobra design includes all of these features. In addition, the unit is fitted with a UV light reflecting louvre panel behind the tubes to further enhance the output. The louvre also provides the further benefit of hiding the insects from view and provides discreet insect control for public sensitive areas. The two specially formulated control boards ensure that once inside the insects are permanently trapped. The Cobra glue boards have a large catch area of 1400 sq. cms. (215 sq. ins.) of insect retaining area which can be changed both quickly, easily and less frequently – ideal for heavy infestations. During independent testing Cobra Translucent has proved to be the most effective product within its class and has consistently outperformed other units with more than twice the light output. 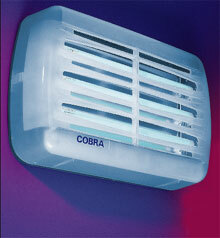 The Cobra can be supplied in 30Watt or 45Watt variants with either translucent or grey covers. light to shine from the front, top and sides of the unit. This technology significantly improves insect attraction. Independently tested with proven higher catch rate. Service on the Cobra trap is done quickly and easily without any need for tools.